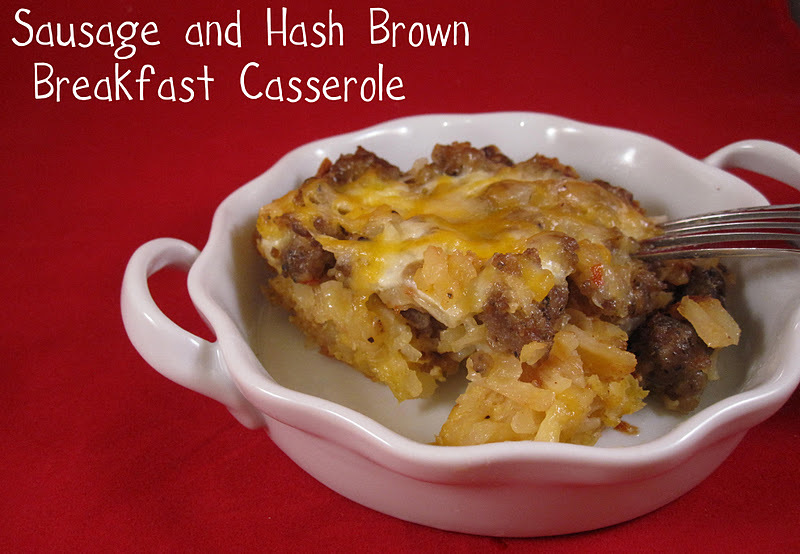 This recipe would be great for Christmas Eve or Christmas morning! Especially since you can make it ahead of time and bake it the next morning when you want it fresh. I made this for my husband's work "breakfast club" and everyone loved it. It could definitely serve a dozen people when accompanied by muffins and fruit in a breakfast buffet. Merry Christmas to all my readers! I hope you enjoy the holidays with your family and friends! I will be back after Christmas! Preheat oven to 350. Grease a 9 by 13 baking dish. Cook pork sausage and onion in skillet until browned and crumbly and no longer pink, drain any excess grease. Whisk together the eggs, milk, salt, pepper and onion powder. Place potatoes in baking dish and then pour egg mixtures over potatoes. Alternate layering the sausage with cheese and add a final cheese layer on top of casserole. Cover pan with aluminum foil and bake for 1 hour before removing foil and baking for additional 5-10 minutes until cheese is melted and a knife inserted into the center comes out clean.